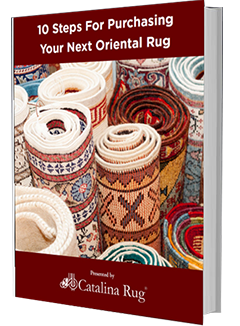 Turkoman rugs were first woven only in Afghanistan, which is where they originated from. 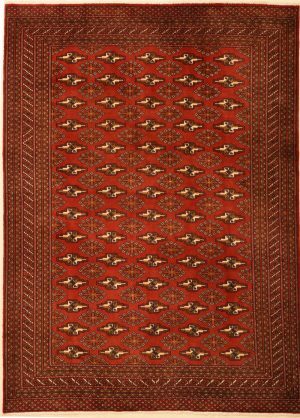 They later made their way into Turkey and Persia over the years by Afghan immigrants who brought along with them their hand-made rugs and sold them in the Turkish and Persian markets. Their distinctive style and coloration soon became very popular in Turkey and before long, rugs in the same style were being produced in Turkey too. However, there was a slight variation in the rugs that were woven in Turkey. 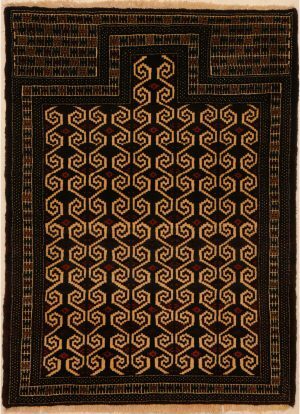 Instead of the single knot weave that the original rugs had, the rugs that were produced in Turkey were now woven using a double knot weave. Everything else remained the same. 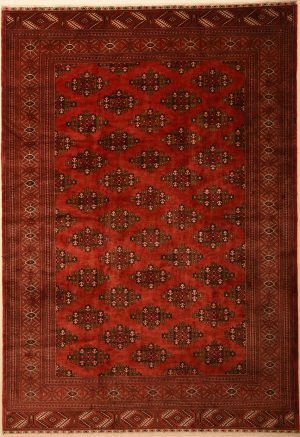 Today Turkoman rugs are woven by nomadic weavers from Afghanistan, Uzbekistan and Turkmenistan in almost the entire northern region of the country, from Kunduz in the east to Maimanah in the west. The only two exceptions are the Sarouq rugs, which are manufactured in the city of Maruchak and the Mauris rugs, which are manufactured in and around the city of Herat. In Persia they are woven in Khorassan, a region that lies in the northeast of the country. Most Turkoman weavers belong to a tribe called the Ersarim, a prominent ethnic group that consists of several different clans. Each of the clans had their own characteristic motifs, which they featured on the rugs that they created. Two of the best known of these motifs are the Tekke gul, which is a smaller gul pattern and the elephant’s foot, which is a larger octagonal gul. Within these two motifs, there is a wide diversity of Esari designs. Turkoman rugs are very easy to distinguish because most of them will almost always feature three distinguishing characteristics. The first distinguishing feature is the color of the background, which is typically a distinctive red to reddish – brown color. The second is their predominantly geometric pattern. 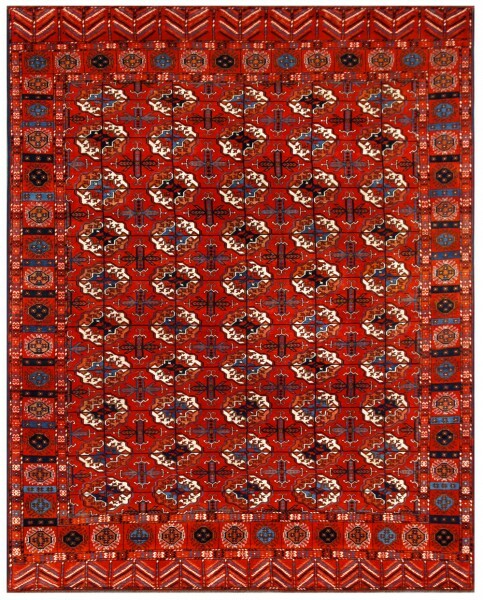 The third feature that you will see in all Turkoman rugs is the unique octagonal gul motif in a number of different variations. As mentioned earlier, one of the unique features of a Turkoman rug is its background color. 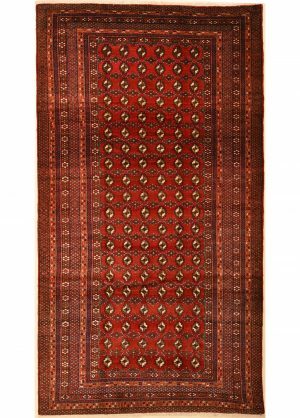 All of these rugs are woven with a very deep dark red or reddish brown background color. 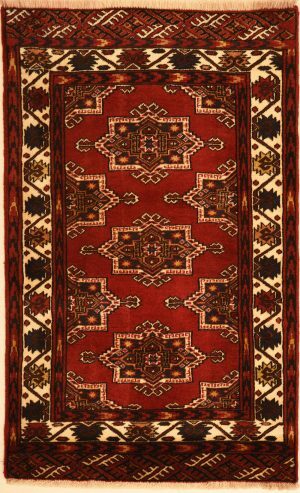 If you are in a store looking at a rug and if it does not have that deep dark red or reddish brown, what you are looking at is not a Turkoman rug. The rug pattern or layout is another distinctive feature of these rugs. 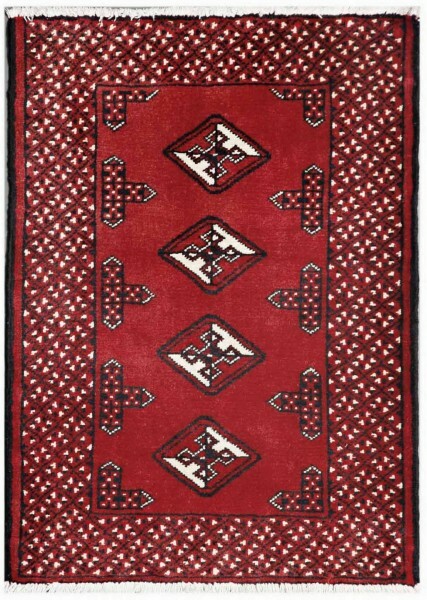 In an authentic Turkoman rug, the motifs will always be laid out in a geometric formation. While you can see the geometric layout even the rug is rolled up, you can see the entire effect of this layout only when the rug is fully opened up and laid out. 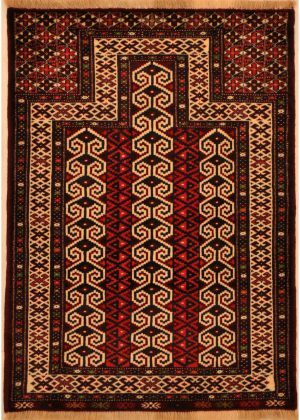 When the rug is fully laid out on the floor you will be able to see the entire layout of the guls on the red or red-brown background. You can also see the individual guls themselves which are laid out all over the rug in repeated rows. 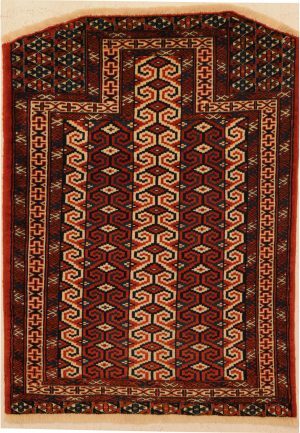 In most rugs you will see smaller sized guls placed in between the repeated rows of major guls so that the entire field is filled with gul motifs with very little blank space in between. Color contrast in the motifs and in the border is created by using blue, beige, white and black. 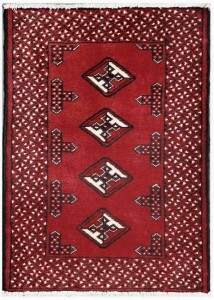 The use of gul motifs is the third characteristic feature of Turkoman rugs. However even though all of the rugs will feature rows and rows of gul motifs, you will see that no two rugs look similar. 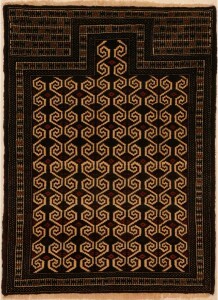 This is because the weavers from the different tribes used different variations of the gul motif in their work. 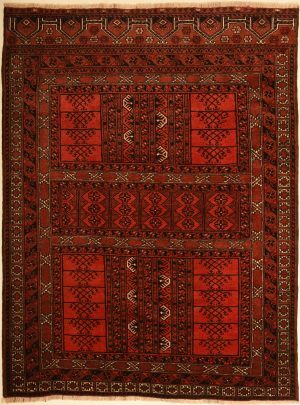 An interesting aspect regarding the gul variations is that in the earlier rugs, the motifs from each tribe looked distinctly different from the others. However, over the years as tribes battled with one another, the uniqueness of the designs was lost as the victorious tribes began incorporating the styles of the tribes that they conquered into their own designs. 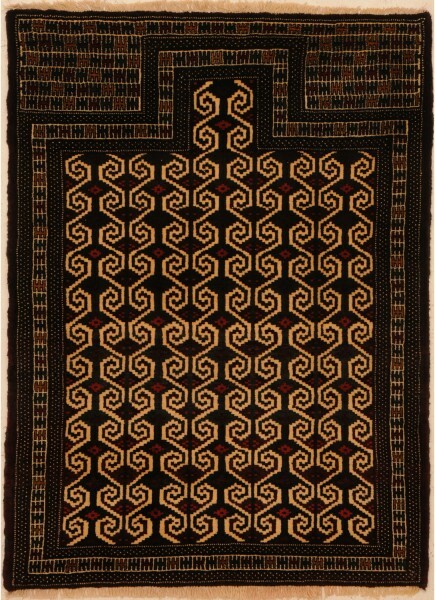 Later rugs show more variations than their earlier counterparts and in some of the more modern rugs, weavers freely incorporate guls from any tribe into their own creations, without any restrictions. However, some gul designs can still be traced back and associated with certain specific tribes of the region. 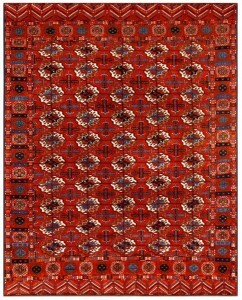 Turkoman ensi rugs. Ensi rugs were not used to cover floors like other rugs. Instead, these rugs were originally used to cover the door or the entrance of the nomad’s tent. This design features a large cross that is woven in such a way that it divides the rug’s background into 4 sections. Each of these sections or quadrants features similar motifs or patterns. One of the most common motifs that is used to design these four sections is the menorah or a design that is almost identical to a menorah, which is a candle stand with multiple holders to accommodate many candles. Turkoman rugs are constructed using 100% pure wool. This wool is sourced from the famous Karakul sheep, an indigenous breed that have two types of fleece growing at the same time. The outer fleece is longer and coarser while the inner fleece is shorter and softer. It is this inner fleece that is used to make these rugs. When the sheep are sheared, the wool is carefully sorted out and balls of wool are made into skeins, dyed and used for weaving. Weaving of these rugs is usually done by women using horizontal looms. With their deep dark coloration and distinctive styling, Turkoman rugs can add instant decorative flair to any of your rooms. You have to be careful though when adding such a rug into any room. Because of their detailed patterning and bold colors it is best to leave the rest of the room relatively plain and let the rug be the highlight of your room.